As a quasi-journalist I feel a strange need to talk about Michelle Obama’s bangs. I’m sticking to the script, though – art this week. Pinellas has quite a bit to offer by way of art this week. Here a few suggestions of events you shouldn’t miss … and her bangs looked pretty awesome. Our state’s copious ‘weird news’ crop can make even the proudest Floridian a bit embarrassed (while still strangely proud) of the Sunshine state. The arts in Pinellas, though, remind us that there is plenty to make your chest swell. This week we’ll be talking with Pinellas’ brainiest, opening the newest glass workshop on the East Coast’s best glass art destination, and meeting two of Florida’s legendary Highwaymen. Art weekends don’t come much more chilled out than this. This week’s suggestions offer a laid back experience in St. Pete. How about adding some nice weather and perhaps two nights in a boutique hotel for a semi-staycation? Tonight we’re getting generous with a meal at the MFA, followed by a weekend art festival and gallery talk. These introductory comments are surprisingly hard to write. Some weeks I honestly have very little to say before moving on to the recommendations. It must be a lot like writing the monologue every week at SNL. But with a much smaller audience. Actually, it’s probably nothing like that. Anyhow, on to the art. Tempus Projects officially begins it 2012-13 season this Friday night. REDUCED5 is the fifth incarnation of a multimedia juried exhibit. Artists generally limit their palette to black and white, and the price tag to $500 or less. Kurt Piazza, the guest juror, also created REDUCED while with the Gulf Coast Museum of Art. Lately, some of the most exciting art nationally has been relatively sparse in color. 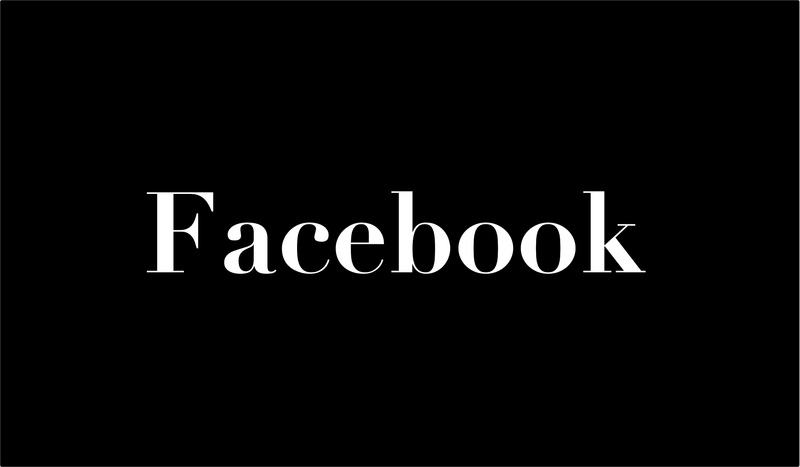 The recent trend of expression in understatement is especially welcome. I trust Piazza’s taste and anticipate at least a few exceptional pieces that illustrate this tendency. Also, the potential for especially good art at a price the 99% of us can afford makes REDUCED5 worth a visit tonight. Becky Flanders, Vince Kral, and Ryann Slauson are just some of the artists that will be exhibiting. This is the last week to catch two of TMoA‘s exhibits: A Hundred Years – A Hundred Chairs and Art of the Poison Pens. I’m not particularly attracted to design exhibits. I guess it’s a character deficiency I’ve made peace with. A Hundred Chairs, though, was surprisingly interesting and relevant. The exhibit effectively highlight the cultural subtext of design, the sociopolitical implications of chairs. It sounds like art-speak, but how chairs are made, who makes them, and what they’re made from says a lot about the society sitting in them. The exhibit, on loan from the Vitra Design Museum, expressed this well and kept me engrossed overall. Art of the Poison Pens, however, I did not get a chance to see. I cannot fairly mete out judgement on this exhibit. I will say I was reluctant to make the trip downtown – the show seemed to be curated for maximal non-statement. I suppose political art that makes a statement exclusively on irrelevant issues seems like a win-win exhibit for the RNC. Suffice it to say, though, that if you visit the exhibit tonight between 4pm – 8pm you won’t have to spend your money on it. 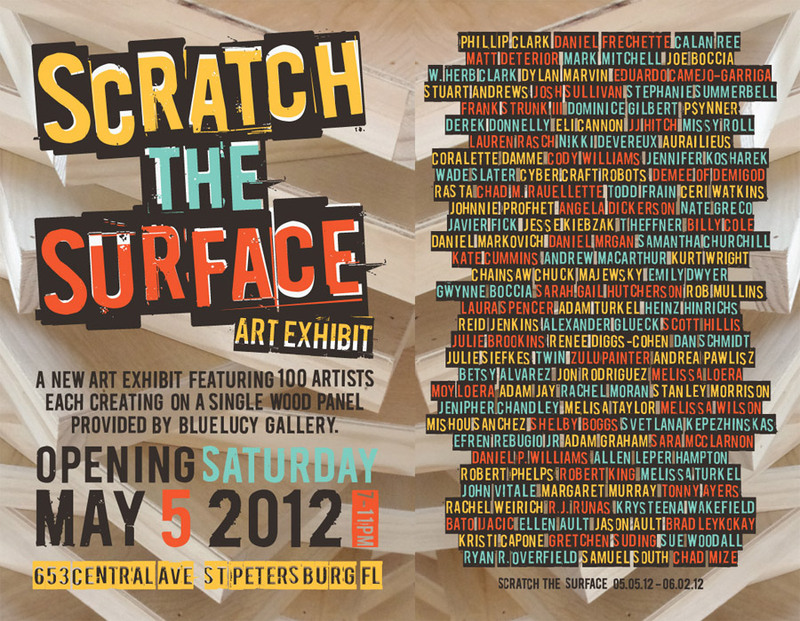 Ybor’s newest and most exciting space will be hosting its third opening reception this Saturday. If the pattern continues into this newest opening, you’re likely to find the entire Tampa Art scene squeezed into this great little space. The three person exhibit will be featuring the work of George Anderton, Zesch Fallon, and Anthony Record. While Fallon’s work tends toward the starkly minimal, Anderton and Record work playfully in the gap between representation and abstraction. All three artists toy with our idea of images rather than actually provide any readily recognizable ones. Though all three artists work under disparate styles, they each work within and around abstraction effectively. This is saying something. To my general annoyance, abstract art is perhaps the style most severely abused by bad art. Saturday’s exhibit is primed to be an exercise in taking that style forward. Summer time is traditionally a respite for the art world. Collectors go to the Hamptons or something and artists get ready for August. Galleries generally exhibit strong work from their stable of artists. That’s NYC rules, though. In Florida we like to disregard time and occasion and generally do whatever we want. I swear I’ve caught myself saying “You mean like pants and shoes?” in response to being told I’d have to wear formal attire once. Anyhow, our little art-cosm also slows down a bit during the summer. It’s nice of Bleu Acier to interrupt the dog days with a quality exhibit. Have you ever seen Radiohead at the New World Brewery? No. You haven’t. That would be awesome, though, right? Now, I’m not comparing Dominique Labauvie in art to Radiohead in music, but I’m sure you grasp my intention: it’s great seeing work in an intimate venue that deserves a large one. In fact you may have seen Labauvie’s work in a large venue before – his sculpture’s are in the collections of several museums. The first time I came across one of his sculpture’s was at the TMoA. 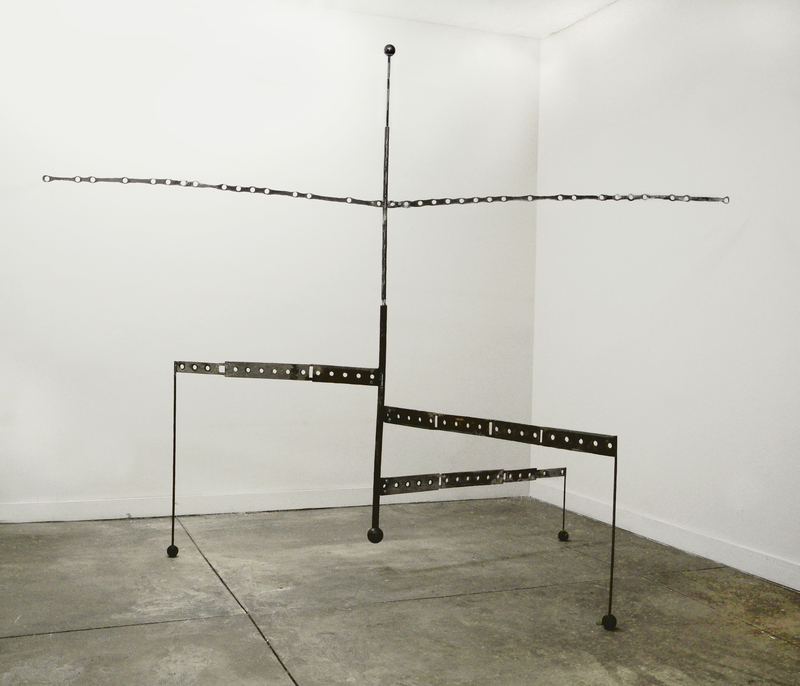 Labauvie works in steel, a medium often thought of as imposing and heavy. However, I was surprised to see the sculptures light and nearly brittle despite its large size. Dominique Labauvie’s work featured in A Gift From the River seems to produce the same effect. The steel used for these new sculptures were sourced from Tampa’s old Columbus Drive bridge and date from 1925. It’s interesting to note there are holes in the steel, that almost look decorative, left over from bolts that once held the structure together. Particularly with knowledge of the steel’s origin, the structure of the sculptures at once gives the impression of referencing the body as well as architecture. Perhaps the titles themselves refer to a grander architecture of heavenly bodies such as Galileo’s Moons and Venus Walks. Regardless, Labauvie’s sculptures invite interpretation and allow for a multiplicity of it. It’s a pleasure to walk around Dominique Labauvie’s sculptures. I suggest taking advantage of the opportunity to do it in a venue that’s a bit more cozy. Don’t let the rain keep you in this weekend. If the wet won’t slow you down, the art will keep pace this weekend. Just drive safely. We’ve got a recommendation on either side of the Bay this weekend. Saturday night the Morean Arts Center opens Leave a Message: Urban Art in Florida. With the recent quasi-drama of the Warehouse District’s murals, this exhibit couldn’t be timelier. In fact, the artist at center of the sort-of-controversy, Akud-Acut, will be among the group exhibited This making the cities initial stance all the more silly: you can pay Akud-Acut to paint on your walls, but only certain ones. I get the uneasy feeling the city wants Miami’s money draw without turning into the Wynwood district. It’s like ordering your McNuggets while asking them to hold the chicken. But that’s neither here nor there. Street Art stopped being edgy about seven years ago. However, rather than get boring it just grew up. It’s like putting down Rage Against the Machine to listen to Fugazi. This is why the Morean Arts Center’s exhibit is timely in larger sense – Street art has grown into a mature form worth spending some time considering. Directly and indirectly, urban art now tackles heavy issues such as property, permission, and class concerns among others. The aforementioned Warehouse District goings-on gives the work a concrete relevancy that I wish happened more often. If somehow this exhibit hasn’t yet reached your cool threshold, there is also an after party down the street at Sake Bomb. The USF Contemporary Art Museum is exhibiting the work of four Miami based artists in the show In Residence. Expect this show to be much more cerebral than the above mentioned. I wrote my latest editorial for Sarasota Visual Art prior to reading about this exhibit. Oddly, the last three paragraphs of the article describing a peculiarly Floridian art culture reads like a preview to this exhibit. In Residence addresses the relationship between people and place, humans and nature. 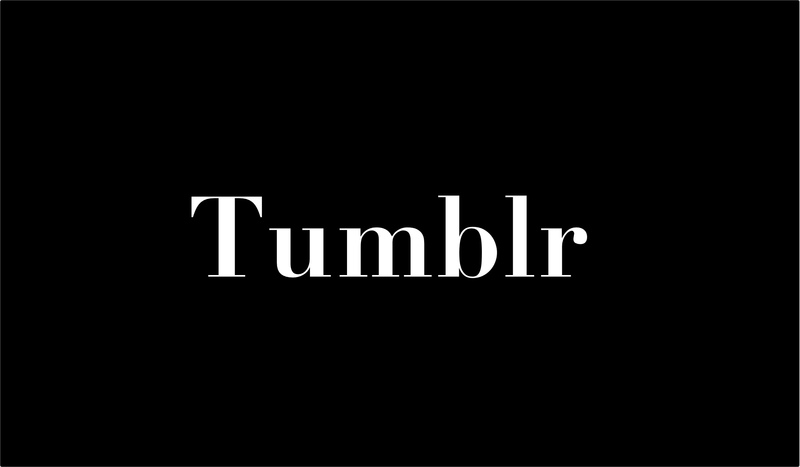 At times the relationship is depicted as a power struggle, other times as nearly sexual. For example, consider Christy Gast’s video work. A figure in a Tuxedo taps along the Herbert Hoover Dike – an enormous example of civilization attempting to exert control over nature (and a reminder of nature’s ability to overwhelm civilization). It’s difficult to tell if Gast’s dancer is celebrating the environment and the structure, or it she is being sarcastic. The drama of the natural world and the city is not exclusive to Florida. However these artists show how the state uniquely typifies it. The scenes and ideas should be familiar but innovatively presented. Please, don’t miss this exhibit. This week’s art binge is dominated by area museums. In fact, there is so much museum fun, you can expect to pass out, forget most of what you did, and somehow end up on Museum Nerds Gone Wild. With that said, we’re heading to Downtown Tampa’s Museum Row. I’m sure, like me, you’re proud as punch of our scrappy underdog of a museum – the FMoPA. They were just getting started with their classy new digs. May is turning out to be quite a month for the museum. The FMoPA is closing Warhol only to open Brassai, exhibits that should make their neighbors across Curtis Hixon park jealous. This Friday the Andy Warhol and Friends exhibit closes with a Factory style party (presumably sans amphetamines). Though Warhol is loved by just about every art loving and art hating person for his screen prints, he was an outstanding photographer as well. Personally, his photographs seem to convey his ideas on fame more clearly than his large and well-known silk screens. I’ll save the rest of the critical writing for the review. 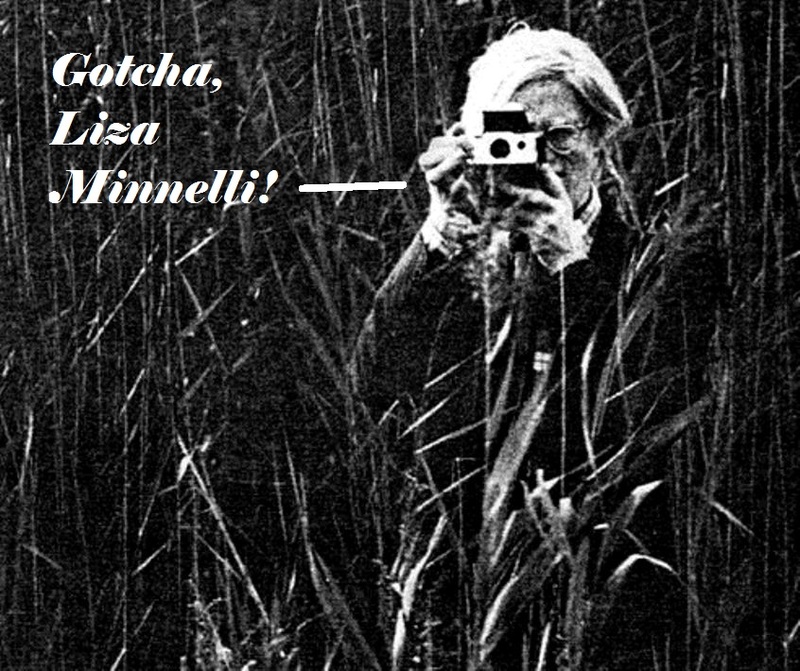 The thrust of the preview, though, is to not underestimate Warhol’s photographs in favor of his paintings. A stroll through the gallery will be worth the $10 admission for non-members. Wine and hors d’oeuvre will also be served with your Warhol. The TMOA‘s new exhibit will feature 100 chairs throughout 100 years from the Vitra Design Museum. At the center of the museum’s new exhibit is “the design of the most ubiquitous of objects”. The ubiquitous nature of chairs allows them to take on and play out the drama of modern life in a way – changing sociopolitical and aesthetic sensibilities are built into the chairs and their design changes with them. Charles Eames’ initial use of ply wood, for example, has as much to do with war as it does with practical design. Anyhow, I realize a lot of serious art nerds have a difficult time digging a design exhibit at an art museum. The differences between fine art and design seem to generally lie in the context of a gallery setting. If you’ve already seen this exhibit or photos of it you know what I mean: these chairs are displayed as and feel more like serious works of art rather than purely utilitarian objects. Also, Saturday night at the museum is the annual Pride & Passion event. The event kicks off St. Pete Pride each year while raising funds to the museum. Individual tickets are $85 and a pair is $170. Admission includes museum membership (! ), food from Timpano, drinks, and entertainment. The event draws a large crowd each year and is a major source of support for the museum. Please don’t impale me when I say this: I have a hard time getting into glass art. I know our beautiful ‘Burg is now famous for it, but it just doesn’t move me. In view of the fact that we’re talking about museum openings this weekend (and many of you may be into glass art), I couldn’t leave this one out. The exhibit presents a number of glass artists including super star Dale Chihuly and local favorite Duncan McClellan. The show coincides with a nationwide celebration of the 50th anniversary of the studio glass movement. St. Petersburg’s 2nd Saturday Art Walk has finally clawed its way out of puberty and into a fully developed art event. Not only is the list of participating galleries becoming extensive, but gallery attendance is ranging from full to packed for many. Need help with your 2nd Saturday itinerary? Here are a few of the stops I’ll be making. 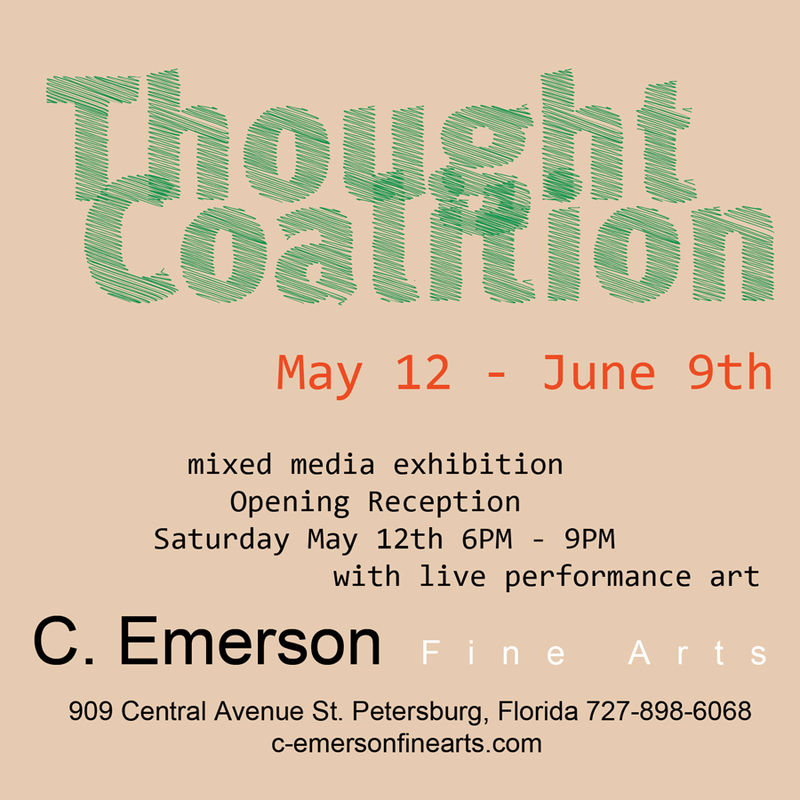 The art collective, Thought Coalition, takes over CEFA this Saturday night. The loosely bound group seems to intend for it to be that way: amorphous, held together by collaboration and process. In the past, some Thought Coalition work seemed like it would fit in better in the Crislip Arcade rather than the Chelsea style walls like those of CEFA or Mindy Solomon. I had the opportunity to walk through this exhibit early, though, and found it strikingly different. I realize I’m in a bit of a weird position being included in the show, but being as critically unbiased as possible: this will be an exciting show. The show is packed (over 20 artists!) but not crowded. I was pleased to find some of the strongest work St. Pete will have seen this season. Allot ample time to spend in this gallery – there is a lot of art to see and the better part of it will definitely hold your attention. It’s time to pick up the CSA shares at the Morean Arts Center (read more about the great CSA program here). The boxes of art are priced to be bargains – Nancy Cervenka‘s work alone makes the box worth the money you’ll drop (check out a sneak peek her contribution here). If you haven’t purchased your share yet there are only four left. You may want to make the Morean Arts Center your first stop if you want to pick one up before they sell out. While you’re at the Center check out their current exhibit Wax: Medium Meets Message. The theme of the exhibit is tied to the medium – encaustic, a wax based paint. Sadly, I haven’t had the chance to see the exhibit yet. It’ll definitely be interesting to see this ancient paint used in a contemporary context. I’m particularly looking forward to walking under Lorrie Fredette‘s installation, The Great Silence (pictured at top of post). I’m going to be straight with you here and tell you this video art seems a bit creepy. I really like video art though, so for the sake of the medium alone, a walk around the block to the Studio@620 is in order. 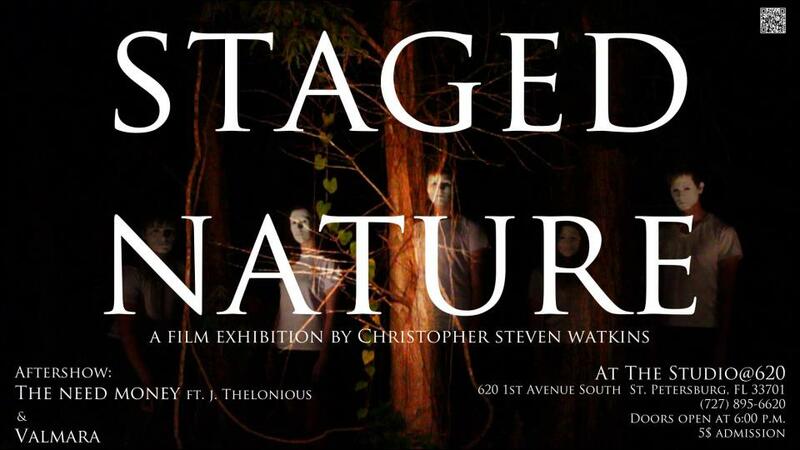 Christopher Steven Watkins presents a series of films titled Staged Nature. I wasn’t able to find much regarding the work and its artist but the style does seem intriguing. Eight short films will be screened. The first four touch on Christian ideology and the last four on Romantic ideology. All eight use nature as a starting point. It’s easy to see how Nature (with a capital ‘n’) relates to Romanticism, but I’m interested to see how it is used in relation to Christianity. Live music will be featured afterwards. All this for five measly dollars! May the 4th be with you! Today is like Christmas for pun-loving Jedis. If you find you aren’t wrapped up in Star Wars themed nerdery all weekend here is some art worth checking out. Blue Lucy opens a large group exhibition this Saturday. Seriously, big. The inevitability that you or a friend is involved is reason enough to stop by. Blue Lucy distributed square wood panels to over 100 local artists on which to create new work. Curatorial restrictions on medium often produce great results or bust, but rarely land in the middle. If not critically acclaimed fine art, though, the show will definitely provide the best locally made hanging-art for the home at a price that shouldn’t be far out of reach. I was definitely able to spy out quality abstract work that will appear in the exhibit from artist Daniel Williams. Also, look out for some local favorites such as Frank Strunk III, Calan Ree, and Coralette Damme. I know, I know: I feature Art on the House often. I swear I’m not on their payroll. There are two specific exhibits worth a gander this weekend, though. Romare Bearden is packing up and leaving town this Sunday. If you haven’t had a chance to visit the exhibit yet, do it. Now. The Romare Bearden exhibit is the most impressive one in the museum right now (and the museum is filled with nothing but impressive exhibits at the moment). Bearden’s work capture’s a timelessness in a way only great work can. It’s nearly impossible to pin his work to any particular decade though it spans several. His use of collage seems to depict everyday life with a familiarity usually reserved for photography or film while also commenting on how it’s depicted. With the surging buzz of activity lately I’ve neglected to mention the loan of sculptures from the amazing Margulies collection. Miami’s Margulies collection is a museum’s worth and worthy collection of modern and contemporary art. The TMoA selected to exhibit sculptural works from the latter half of the 20th century with an emphasis on the natural form. The exhibit includes some serious art icons but I particularly enjoyed seeing George Segal’s Three People on Four Benches and Isamu Noguchi’s Judith. This Saturday I’ll be taking my first ride on the Tampa Bay Monorail. How better to see everything in St. Pete and Tampa on the same night? I’m sorry to play such a cruel joke on you. There is no monorail system. The Bay area could sure use one, though. Case in point: Disney World. Did you ever visit Disney World before they got a monorail? What a dump! Anyhow, as I mentioned there are plenty of great events to check out on both sides of the Bay this week. St. Petersburg’s popular 2nd Saturday Art Walk just got a guide upgrade. Bay area art doers (it was that or ‘arts facilitators’) Reuben and Hunter developed the new website: check it out here. The new virtual home has definitely increased the already busy buzz for the monthly event. How cool would it be for everyone to meet for an art party at the Independent or Sake Bomb afterwards? Anyhow, here are a couple of highlights for your walk. I opened the emailed flyer to this exhibit while at work. I was dumbly shocked to find a photo of a naked woman wearing a bear mask in what appears to be the back of a car. In retrospect, the exhibit title in the subject line should have tipped me off that it would be NSFW. The fact that the art is sexually explicit seems to be the point of the Mindy Solomon Gallery‘s latest group exhibit. The show that opens this Saturday features artists Scot Sothern, Christina West, Barbara DeGenevieve, Bart Johnson, Becky Flanders, Georgine Ingold, Leopold Foulem, Anne Drew Potter, and Bonnie Marie Smith. I’m curious to see how this show is curatorially executed. Luridness as the premise for an exhibit could quickly degenerate into a freak show – strengthening the stereotype of the deviant or the Other (with a capital ‘O’) rather than investigating it. On the other hand, the theme also lends itself to a fair amount of potential. 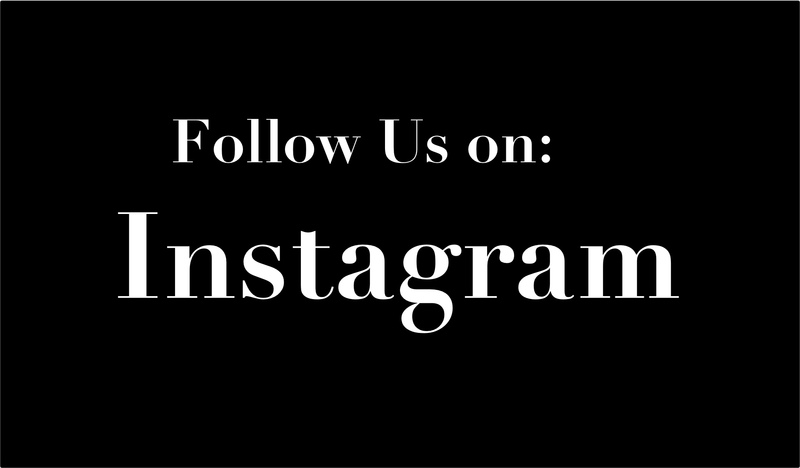 You’ll have to stop by the gallery to see for yourself. Regardless of how the exhibit ends up being presented, Mindy Solomon has rounded up some impressive artists. There will be several pieces that should be the highlight of the art walk. 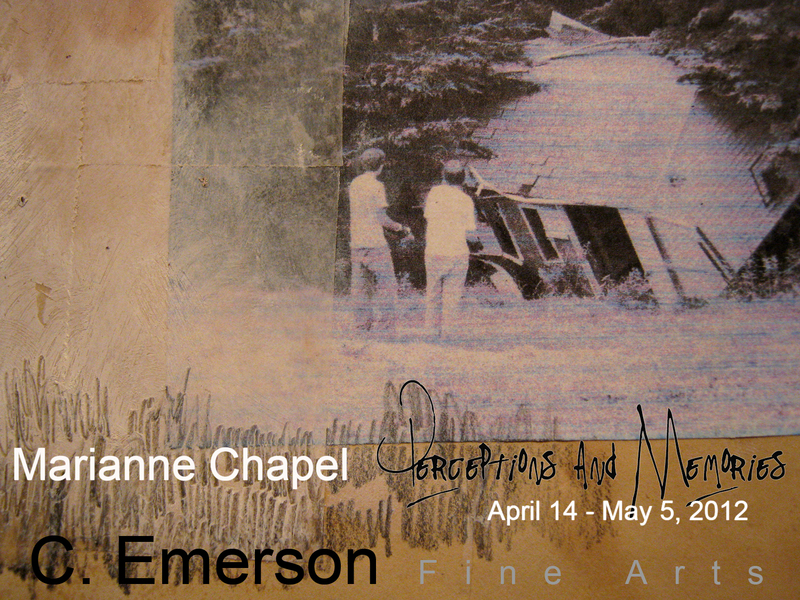 Opening this Saturday, CEFA presents a solo exhibit of multimedia work by Marianne Chapel. She is an abundantly awarded and well-traveled artist with studios apparently both in the Panamanian jungle and the mountains of Quebec. However, Chapel also has local connections teaching in the past at the University of Tampa and Ringling College. It’s clear from the little I’ve seen, that Chapel’s work deals with the way stories are told, the way they’re heard, and the in-between. She uses materials that are reminiscent of personal ephemera, recalling past family mementos. Chapel uses these personal seeming narratives to comment on something larger. 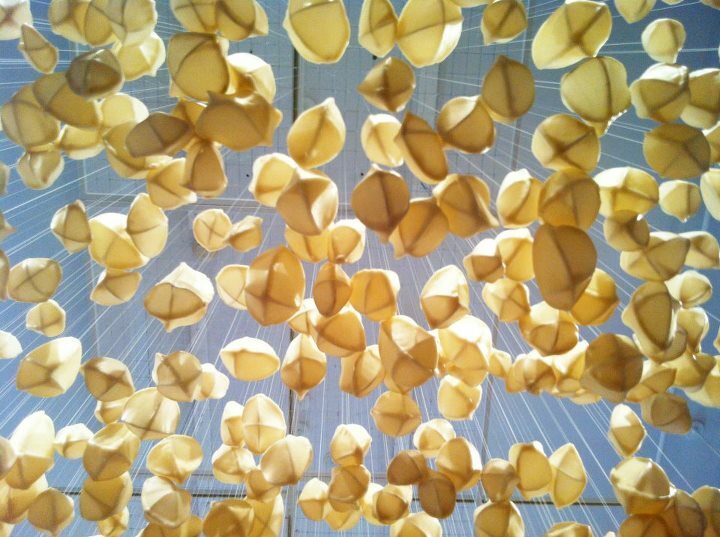 Her installation, Dirty Laundry warrants a stop over at the 900 block gallery. If you’re reading this blog, you’re also probably a big fan of PBS‘ award winning documentary series, Art21: Art in the Twenty-First Century. If you haven’t heard of it before, remember that it is me, Danny Olda, that introduced you to the series. The first five seasons of the series have been well made and absorbing. The sixth season is set to top them all. 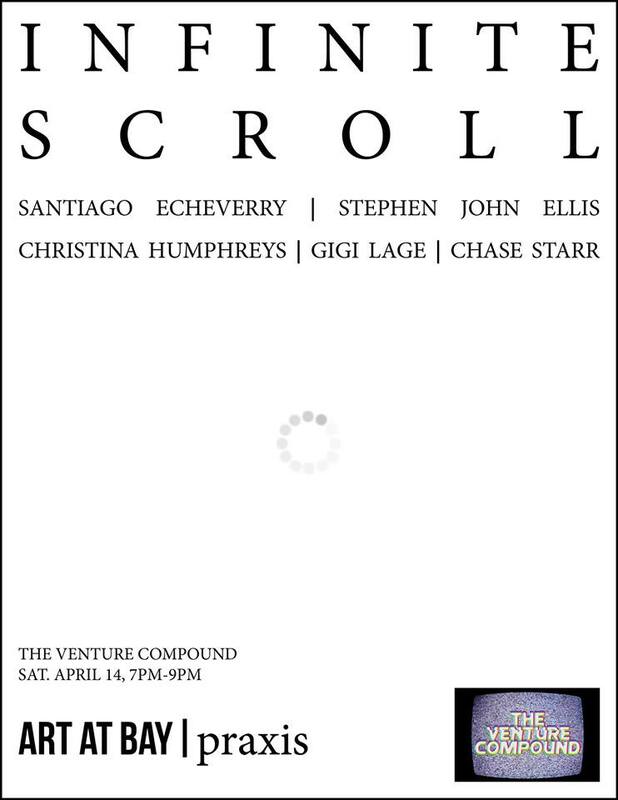 Saturday night Tempus Projects will be screening “Change”, the first episode of the new season. 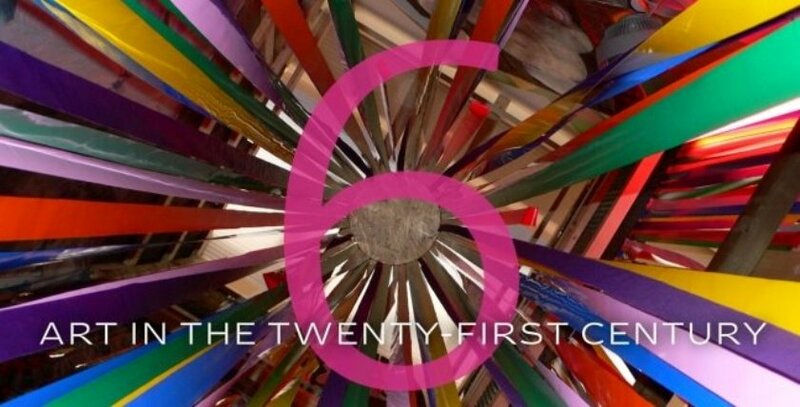 The first episode focuses on artists Catherine Opie, El Anatsui, and Ai Wei Wei. I will admit I cheated: I was able to get my hands on the DVD and watch the first couple episodes. With the saga surrounding Ai Wei Wei of late I was especially anticipating the section focusing on him and his work. Art21 touches on his recent run in with the paranoid Chinese state but thankfully focuses on his brilliant work. It was with the portion on El Anatsui that I was pleasantly surprised with, though. His ever fluid work, issues of labor, change, and post-colonialism add depth not often found on television (a thimble’s worth of which would’ve improved Morley Safer’s 60 minutes piece 100 fold). I hope I’m wrong but from what I can tell WEDU and WUSF will not be airing this series (?!) so make sure you at least catch it at Tempus Projects. There will be snacks and drinks but make sure you RSVP here.